"Hey! Hey! It's your ol' pal Krusty for my new pork sandwich, the Clogger! If you can find a greasier sandwich, you're in Mexico!" -- Krusty the Clown in "The Simpsons Movie"
And that sandwich, my friends, is the torta. But you don't have to go to Mexico to find it. Deep in Santa Ana -- a city that has redubbed itself as "Downtown Orange County" -- an institution called El Gallo Giro makes one of the best. The greasiest is a behemoth called the Torta Cubana ($5.99). Yesterday, I ordered one. Allow me to describe it. The thing weighed as heavy as a shotput in my hand. It boasts not one, not two, not three, but four kinds of meat. There's a spicy, chili-marinated filet of lean pork leg simply called pierna. Then there's jamon, a floppy slice of ham that looked like Danola. There's also sliced headcheese -- bits of the nasty odds-and-ends of the beast suspended in gelatin and formed into a loaf. And finally, a beef steak, pounded thin, breaded and deep fried. This one's called a Milanesa; my favorite protein in the pile. But that's not all. The bread was thick and dense, more macho and built of a heartier stock than a normal burger bun. One side was slathered in refried beans. Then everything else was stacked on top of this base. The meats. A tangy slab of queso. Avocado. Pickled jalapenos. Wilted onions. Tomato. And a few measly shreds of lettuce that did absolutely nothing to offset the wanton excess of it all. Since it was assembled on a griddle, the sandwich was still warm when I got back to the office -- a good thing too because all that the grease would congeal otherwise. But common sense told me that I could not, and should not, attempt to eat the whole thing in one sitting. So I cut it into two halves. I bit into one and before I knew it, that half was gone. I was full, but not satisfied. I wanted more. More of that porky flavor. More shards of that crispy beef. More of that rich, yet cooling avocado. And, yes, even more of the disturbing cartilage crunch of the headcheese. Try the aguas frescas next time. They have six to choose from every day. Whoa. Not sure about the head cheese but that thing looks pretty dang tasty. I haven't been too impressed with their food. Of course, the only branch I've eaten at was the one in Fontana, out in the sticks, LOL. I LOOOVE their Horchata. It's so creamy. The headcheese is a bit...ummm...interesting. Can't finish the whole thing?...have you gone soft??!! The head chees is the only thing holding me back on this one, but it sure looks good! Looking at the picture is giving me pork flashbacks! I'm getting weak in my old age! Oh boy! Have I got a few suggestions for you! If you can find someone to treat you, go to Bluefin on the Newport Coast. Get the omakase of course. If you can't. Then settle for a $5 meal of the best nachos on earth at Alertos. Or for my sushi fave at the moment: Kaisen Sushi. A revolving sushi bar, yes. But a good one! Can't go wrong with the refined Vietnamese at Quan Hy either or the Japanese pub food at Honda Ya. For French and shopping afterwards, there's the new Marche Moderne in South Coast Plaza. Be sure to eat on the patio! Have fun! Let me know where you end up! Let's see who ends up getting a triple bypass first! I remember you mentioning kaisen when we spoke in email - I'm actually going to a revolving sushi place next saturday but it's up in L.A. it's called kado. it will be my first revolving sushi experience, but the girl I am going with says it's great, so I'm game! Finally, a reason to visit El Gallo Giro. Otherwise, it blows. I was there Sat. and it was freaken hot eating in, like there was a place to sit and eat anyways but it sure was good food. Gallo Giro makes the best torta Cubana! I also love their panderia (bakery) next door. Do not fear the head cheese. All you guys eat those Bahn Mi sandwiches and and they have head cheese in them (dyed pink). I will try this sandwich soon as I have never see this combo. I think they are expensive and their tacos are not as good as Carnitas Los Reyes in Orange where huge tacos are still a buck! I was afraid of revolving sushi at first, but *knock on wood*, I'm still alive to tell of my revolving sushi tales! It was good. Though thinking back, I wish it were griddled more (maybe even pressed). More like a true Cuban sandwich. But who am I kidding, I would've scarfed it down just the same. Oh man. It's a freakin' sauna in there. I don't know how those people keep their sweat from dripping into the food...wait a minnuuuute!! Their bakery is one thing I haven't tried yet. But those pink cakes look immaculate. It was manly alright. Except it does make more of a man out of you -- at least by weight! You're right. Hard to beat Los Reyes. By the way, Los Reyes chorizo es muy rico! lol. i knew you could/would finish it, elmo! Me needs me some protein-filled torta too after my work-out. Do you know if there's one in SGV? Yum. I'd eat the whole thing, too. I'd pretend I wasn't going to... but I would. Hmm. Good question. Tortas in the SGV. There has to be one, but exactly where?! There's a El Gallo Giro in East L.A.! I felt the pangs of guilt immediately afterwards. Followed by a strange, satisfied sense of accomplishment. Nothing better than a torta to put the calories back that you burned...and then some. OMG, i can't stop looking at that sandwich. I went there last Saturday. I could not get myself to order the headcheese, so I just had the carnitas torta. I think the thing weighed 7 pounds! It was great, and even though the place was hot, crowded and a bit confusing as to the ordering process, I will go back. Mesmerizing sight isn't it?! I drool everytime scroll down. Ha-Haahha..Okay, That quote was hilarious! wow, I'm amazed that you would actually go to "El GAllO GIRO". I live in Santa Ana so honestly there are better places to visit. You can find "El Gallo Giro" restaurants all across Southern California. I had the Torta Cubana about two months ago... I'm craving one today. Will most likely go today. 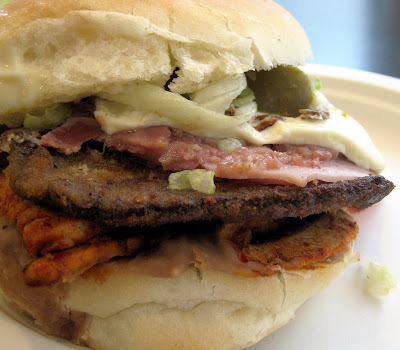 "Not well known in the U.S. Tortas play a key role in Mexican cuisine. 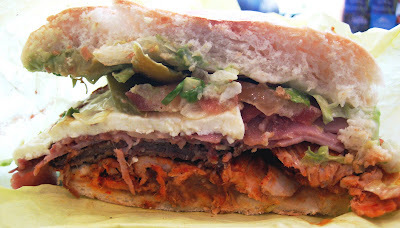 Tortas are mexican sandwiches in which we use our own freshly baked buns to create flavors found nowhere else. Our best seller is our Torta Cubana that has Marinated Pork Leg, breaded beef, ham, head cheese, avocado, cheese, and beans. It is an incredible traditional concoction that bursts with flavor from the first bite to the last. You can also order Tortas of Milanesa (breaded beef), Carne Asada (marinated grilled steak), Pierna (Marinated Pork Leg), Carnitas (Pork), or Chicken."